Small derby in the Spanish capital casts its shadow! In the Spanish La Liga, the title seems to be no longer Barcelona. This is likely to be a bitter pill especially for the supporters of Real Madrid. Nevertheless, the mood in the Royal since the return of Zinedine Zidane again significantly better. In the current season, the Madrilenians can not win another title, but still the Royal want to give their many fans as many victories. Next Monday sees the closing of the 32nd matchday to a meeting between Leganes and Real Madrid, which at first sight does not appear to be a difficult one. The host Leganes plays measured against his possibilities quite a good season and moves in the safe midfield of the table. With already ten points ahead of a relegation place, the team of coach Pellegrino to the league must not worry. On the other hand, Leganes, with a good deal of luck, could perhaps win one of the coveted starting places for the Europa League. In any case, this project would be a surprise in the upcoming duel against Real Madrid. In the duel between Leganes and Real Madrid a tip on such a home win in the top is rewarded with odds of up to 5.50. However, the Royal will certainly try to confirm the rising form under Zidane in Leganes with an away win. Leganes is playing his third season in La Liga after the rise by now. In the past two seasons, the team from the Spanish capital has been only marginally in the highest Spanish football league. For this reason, the leaders of CD Leganes should be very pleased with the recent performance of their team. Finally, the team of coach Mauricio Pellegrino is currently with 40 points currently in eleventh place in the table. With already ten points ahead of a relegation zone, Leganes no longer needs to worry about relegation. Correspondingly, Leganes can actually go into the final stages of this season. At least the fans might still dream a little bit of a jump on a Europa League place. The whole thing is certainly not completely unrealistic, because the gap to the sixth place in the table remains only six points. From the point of view of CD Leganes, it would be important to be able to build on the achievements of the last few games in the coming weeks. After all, Leganes has remained undefeated three times in succession. Leganes first got a 2: 0 away win at Getafe. After that, Guido Carillo’s stoppage to Rayo Vallecaono added to a lucky 1-0 win at home. Legan lost a total of two league games this season. Last weekend, however, it was enough for an away game at Alaves only for a draw. However, the coach should have been completely satisfied with the one point. After an early goal, Leganes was back in injury time and was only able to make it through a goal from Jonathan Silva at least for the draw to 1: 1-final. In the upcoming derby against the great Real Madrid, the coach must continue to do without the injured Youssef En-Nesyri and Kenneth Josiah Omeruo could fail due to a muscle injury. Real Madrid can not achieve much this season. After all, the Madrid are eliminated not only in the Spanish Cup, but also in the Champions League. The Royal had to defeat in this competition as defending champion in the second round surprisingly against Ajax Amsterdam. Above all, the clear defeat in the second leg led in the wake of the dismissal of coach Solari. This meant two coaches had to pack their suitcases prematurely at Real Madrid this season. As successor, the president presented with Zidane the success trainer of recent years, which has now taken over after a brief interruption in the Madrilenes again the helm. Since the Frenchman is back in office, Real Madrid has played four games in La Liga. The balance can be seen in at least three wins under the French coach quite well. However, there was a 2-1 defeat on the penultimate round at Valencia. Last weekend, Real Madrid played a game against Eibar at home in Santiago Bernabeu. Here it was for the Royal after a weak first half, initially with a 0-1 deficit in the half-time break. During this break Zidane seems to have found the right words in his speech. Finally, Real Madrid was still able to turn the game around and in the end, after two header goals from Karim Benzema, it was still a 2-1 home win. In the upcoming duel between Leganes and Real Madrid, the odds for a tip on an away win with up to 1.63 are certainly in an interesting area. However, the coach in Leganes has to give up the suspended Marcelo. In addition, there are still slight question marks behind Varane due to flu. There has been a derby only eleven times between Leganes and Real Madrid. For CD Leganes it was enough in these duels twice for a win. However, the balance clearly speaks for nine victories for the Royal. By a draw, however, ended no game between these two teams from the capital. Incidentally, in the first round of the current season, Santiago Bernabeu had a clear 4-1 win for Real Madrid. The derby between Leganes and Real Madrid does not necessarily promise great emotions. But the differences between the two clubs are simply too big and this city derby does not look back on a great history. Nevertheless, one will be particularly pleased with the supporters of CD Leganes on the visit of the great Real Madrid. Make sure you create a bet365 account before betting and get all the info about bet365 sign up offer and bonus code in 2019  it is super easy for anyone ! In this upcoming duel between Leganes and Real Madrid speaks in our prediction significantly more for the Royal. This is not surprising, because Real Madrid quickly got a better shape under Zidane. However, even under the French coach does not shine much at Real Madrid. For that reason, Leganes will be a bit hopeful for a surprise. This hope is supported by the proper home record of Leganes. Because in the past 15 home games, there were only two defeats for CD Leganes. Nevertheless, speaks for us significantly more for the Royal. 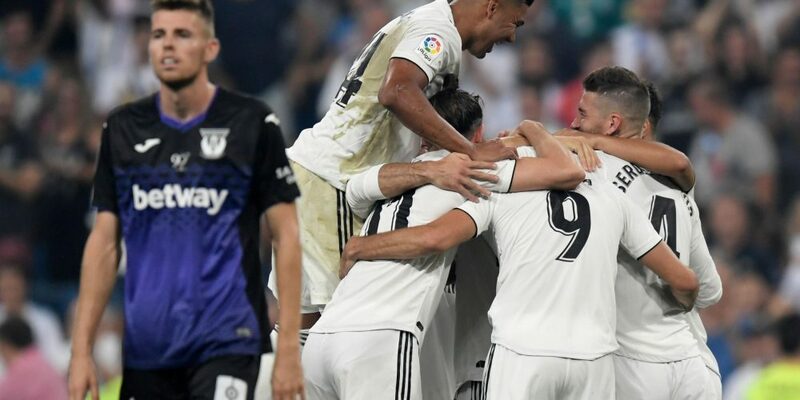 For this reason, we place in the duel between Leganes and Real Madrid our tip for odds of at least 1.63 on an away win.